Wireless Video | Rio Rancho, Corrales NM | Southwest Security Inc.
For a no-obligation security survey & proposal, simply complete our form. We will follow up with you to schedule a visit from one of our security professionals. By filling out our form, you are agreeing to be contacted about security services at the email address and phone number provided. Keeping an eye on your home or business has never been easier with our interactive camera monitoring technology. Wireless cameras are available as a standalone product, or can be integrated seamlessly with a complete security system from Southwest Security. You’ll have 24 hour access to all activity at your home or office through a simple login from a smart phone or any computer with an internet connection. All camera recordings are stored on a cloud server for increased security. From a simple one camera add-on to an unlimited, casino grade system for your business, we can customize a wireless camera solution to fit your needs. Our indoor IP cameras offer the choice of fixed or pan/tilt viewing, and include built-in 802.11 secure wireless connectivity. Our industry leading outdoor IP camera supports Power-Over-Ethernet and ensures that activity around the property is visible, day and night. Wireless cameras are not completely wireless! While the camera is wireless, the camera still needs power. Your wireless camera will need a power source near the mounting location. This is part of your customized solution when you work with Southwest Security. See who is at your entry door, keep an eye on your children, and watch your home while you are away. 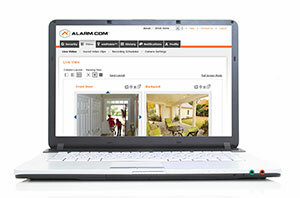 You can view your household cameras remotely via a secure Internet website. A perfect solution for the business owner that travels yet still wants to keep an eye on the store. The Southwest Security team was awesome! We are completely satisfied with their work and know that they are there to support us when needed! Absolutely professional. The owner has assembled a superb team. We are comfortable recommending Southwest Security to all of our friends! I just wanted to say what a great job you and your team did installing my security system for home and business. Completely satisfied! Southwest Security is a trustworthy and affordable security company. As a police officer, security systems are at the top of the list for crime deterrence. Outstanding job. The professionalism we experienced was top notch. We will recommend you to everyone we know. Excellent equipment with great installation and service. We enjoyed working with Southwest Security. Facebook Google Plus Base Content Copyright © 2019 Market Hardware, Inc.